Tear bread into pieces and put into a bowl with the crushed garlic. Pour in a good ¾ cup / 200ml of cold water and leave to soak while you prepare the remaining ingredients. Cover the tomatoes with boiling water, leave for a couple of minutes, then scoop out and peel off their skins. Quarter and seed the tomatoes, putting all the seeds and clinging juicy bits into a sieve set over a bowl. Put the skinned flesh into a separate bowl. When all of the tomatoes are done, press the seedy bits in the sieve to extract as much juice as possible, then add it to the tomato flesh. Put the soaked bread and garlic, tomatoes, cucumber, red pepper, onion, olive oil, balsamic vinegar, and sugar in a food processor (you should be able to do it in just one batch). Process to a coarse purée and season with salt and pepper to taste. You can leave the soup chunky, or whiz it a bit longer, and then press through a sieve, if you prefer. Cover and chill for 2 to 3 hours, then taste and adjust the seasoning. 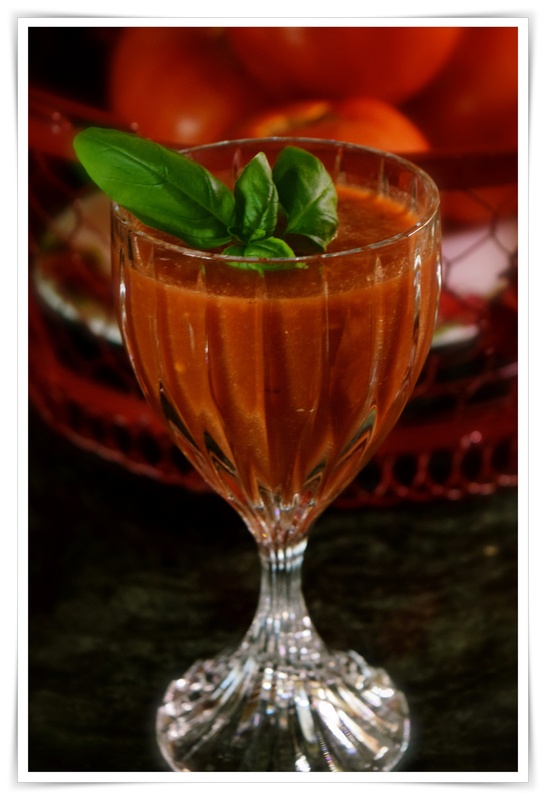 Serve the gazpacho topped with croutons and shredded basil or chopped parsley. Fearnley-Whittingstall, Hugh. River Cottage Veg: 200 Inspired Vegetable Recipes (Kindle Locations 1877-1879). Potter/TenSpeed/Harmony. Kindle Edition.